We all have a name. Most (though not all) are given that name by our parents when we are born. What that name is and how it was chosen can be very interesting – are we named after a family member, a special friend, the midwife or doctor who delivered us, a celebrity? 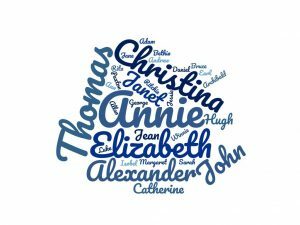 In the past, in Britain, it can be very obvious to a family tree researcher where the name came from as a traditional naming pattern was generally used. This means that a couple’s first born son was named after his father’s father, the second son after his mother’s father and the third son after his father. For girls, the pattern was similar – the first daughter was named after the mother’s mother, the second after the father’s mother and the third after the mother. After that the pattern gets a bit less rigid with the names of the father’s and mother’s siblings being used, or the father’s or mother’s grandparents. These patterns can be both a help and a hindrance to genealogists. What happens, for example, when one of the early children dies young? Does that child’s name get dropped from the list, or, as is more likely, the name is “re-cycled” and given to the next child – causing confusion to a researcher when the second child appears in a census record with what appears to be an incorrect age recorded. And what about the descendants of a third son? In one family I researched, all the males in a direct line from my client’s grandfather back for at least five generations, had the same name. This situation could come about when the third son was named after his father – I’ll call him Peter. When Peter “Junior” had a son, he naturally named him after his father’s father – Peter. And so it goes on – and on. In the family I was researching I wasn’t able to go back far enough in the records to find a different name. Another issue arises when all the children of a large family then have children of their own. Thus, when each of the ten surviving children of my Great Grandparents Alexander and Christina Winning had children of their own, the first born boys were called Alexander and the first born girls were called Christina. 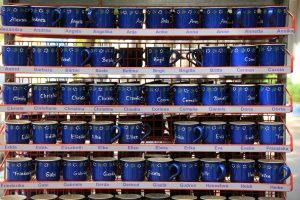 Meaning there are lots of cousins all with the same name – in the end there were five Alexander’s and eight Christina’s. The only way to distinguish between them was to use nicknames – so some of the Alexander’s become Alex, Sandy, Xander, and some of the Christina’s become Chris, Tina, Tia, wee Chris. Not a problem in the family but a challenge for the unwary researcher. Firstly with all the Alexander’s you have to work out which belongs to which parents, and then you have to work out which one got which nickname – some of which were more obvious than others. And to add to the confusion one of the grandsons, named George, married a girl called Christina! At least my Grandparents thought “out the box” and, using my Grandmother’s surname rather than Christina, named their daughter Winnie (NEVER Winifred! ).